This Kevlar thread has a 0.026" diameter. The tensile strength for this shock cord is 140 lbs, sufficient for just about any low or mid power model rocket. 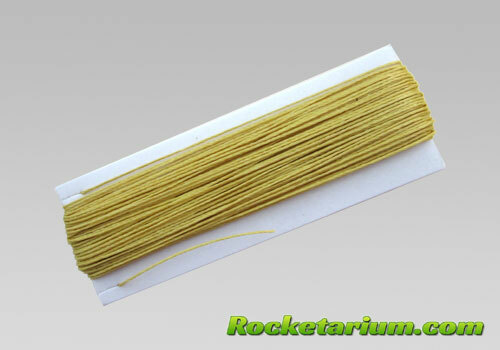 Kevlar is very heat-resistant, which makes it an excellent candidate for model rocket shock cord material. It won't be bothered by hot ejection gases. As an added bonus, it is long-lasting. It will easily out-live nylon or elastic shock cords. This item is sold in multiples of 10ft. If you order 3 of them - you will receive one 30 ft long piece. How long should a Kevlar shock cord be? As a rule of thumb, the shock cord should be 2-3 times as long as your rocket. This largely depends on which rocketry hobbyist you ask, there is no real consensus. For a model rocket that is 2 foot long, a Kevlar shock cord could be from 4 to 6 ft long.